A classic Margarita has tomato, olive oil, mozzarella and basil – but substituting fresh spinach for the basil gives this chicken dish a fresh twist. A smooth, rich bisque made with tomatoes, roasted red peppers and butternut squash simmered with butter, real cream and garlic. 5. 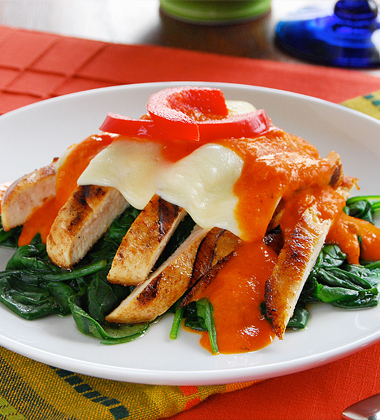 Alternate sliced chicken breast with sliced 4-5oz of mozzarella on top of bed of spinach. 6. 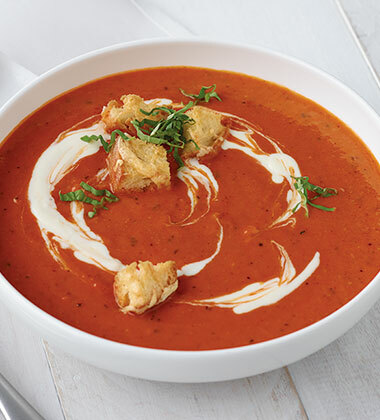 Cook Verve® Tomato Roasted Red Pepper Bisque to a minimum of 165F and ladle 4 oz on top of chicken and cheese.